The Levitt National Tour returns this weekend! We’re so excited to announce that the Levitt National Tour is back with a headlining act you won’t want to miss! 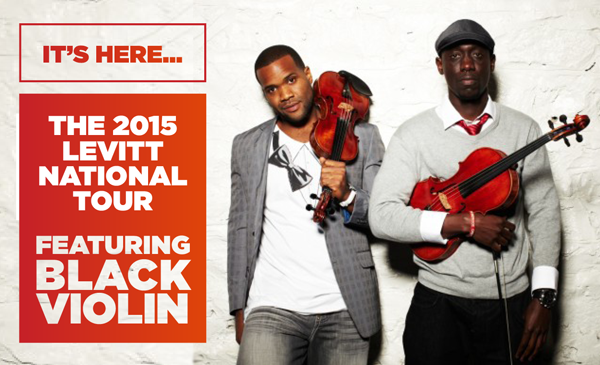 This weekend, Black Violin—the genre-busting pioneers of urban meets highbrow—kick off the second annual Levitt National Tour at the historic Levitt Shell in Memphis, 6/13; followed by stops in five other Levitt locations—including Arlington, Texas, 6/20; Los Angeles, 6/26; Pasadena, Calif., 6/27; Bethlehem, Pa., 7/11; and Denver, Colo., 7/17 (where audiences will receive a taste of what’s to come when their Levitt Pavilion opens in 2016). Each tour stop features a free concert and lively post-show Q & A. Black Violin will also lead community outreach activities throughout the tour, as part of their commitment to reach 50,000 youth every year. Get ready for a high-energy sonic party at your local Levitt venue! This entry was posted in Levitt National Tour and tagged Black Violin, Levitt National Tour, Levitt Shell on June 12, 2015 by Nicole McGaffey.